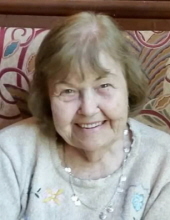 M. June Beahm Wedge, age 90, of Evans City, passed away on Monday, April 8, 2019 while under the care of UPMC Passavant Hospital in McCandless. Born June 5, 1928 in Evans City, she was the daughter of the late Horace Beahm and Clara Lauten Beahm. June belonged to BPW, Eastern Star, and was a Girl Scout leader. She was also a member of St. John’s United Church of Christ in Evans City. She was full of energy until her final days and always had a smile for everyone. June loved fishing in her pond, flowers, gardening, baking, every holiday, living on the farm and loved making incredible caramel popcorn. June leaves behind to cherish her memory her children, Barry Wedge of Evans City, Jill Wedge of Newell, WV, and Jamie (Richard) Wisniewski of Harmony; her grandchildren, Heather Wedge of Pittsburgh, Brian (Cherry) Wedge of San Diego, CA, Bridget Bemis of Newell, WV, Jason Wisniewski of Salt Lake City, UT, and Nicole Wisniewski of Lexington, KY; and her great-grandson, Connor Wedge. In addition to her parents, June was preceded in death by her husband, Charles Arthur “Bud” Wedge, who she married on May 6, 1949 and who passed away on April 16, 2015 and her daughter, Joyce, who passed away on March 21, 2018. Friends will be received from 6-8 P.M. on Friday, April 12, 2019 and from 2-4 P.M. and 6 P.M. until the time of the funeral service at 8 P.M. on Saturday, April 13, 2019 at the Boylan Funeral Home & Cremation Center of Connoquenessing Twp., 856 Evans City Road, Renfrew, PA 16053, with Rev. Lisa Griffin, officiating. June will be laid to rest, alongside her beloved husband, at the National Cemetery of the Alleghenies in Bridgeville. Flowers will be accepted and expressions of sympathy may be shared with the family at www.boylanfuneralservices.com. To send flowers or a remembrance gift to the family of M. June Wedge, please visit our Tribute Store. "Email Address" would like to share the life celebration of M. June Wedge. Click on the "link" to go to share a favorite memory or leave a condolence message for the family.